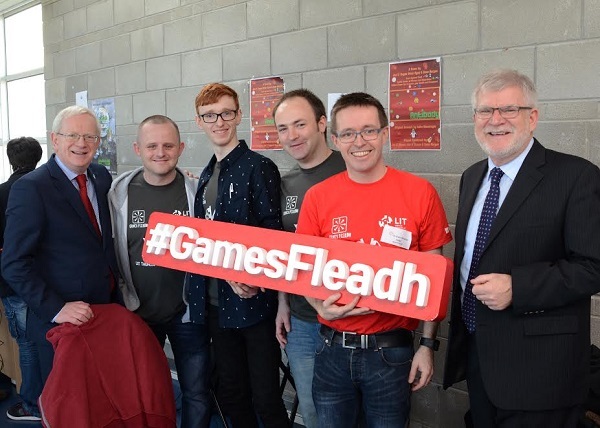 – More than 30 Third Level Teams took part in #gamesfleadh Competitions. Fifteen LIT Thurles students have been recognised for their achievements in game design and development at Games Fleadh 2017, an all-island games design and development competition for third-level students. 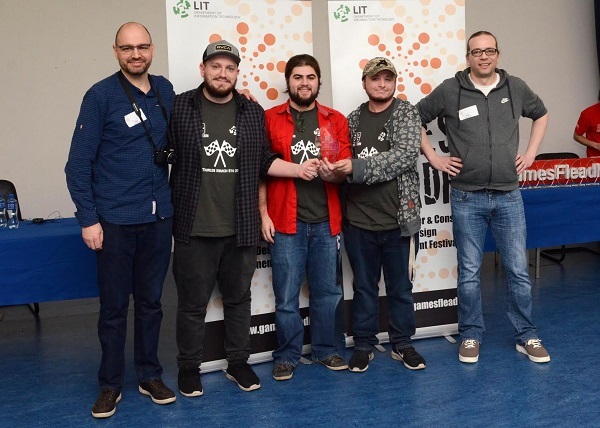 The University of Limerick is also celebrating a successful Games Fleadh having secured the overall prize as winners of the Games Studio Challenges. Professor Vincent Cunnane, President of LIT photographed at Games Fleadh 2017 with (left to right) students Brian Ryan, Sean Horgan, and Joe O’Regan; Dr Liam Noonan LIT Games Development Lecturer and Mr. Paschal Meehan, Head of Faculty of Applied Science, Engineering & Technology (ASET). designed and developed the winning game “Trash Team Racing” and were presented with their award by Ms. Janice O’Connell, Head of the Dept of IT, Limercik IT. Supported by Microsoft Ireland, EA Games, First Data, Game Sparks, Game Stop, and the Irish Computer Society, the 14th annual Games Fleadh event took place on Wednesday, March 8th on LIT’s Thurles campus which is home to the B.Sc in Computing in Games Design and Development. Event organisers reported their busiest year yet with more than 30 teams taking part in various game design and development competitions. The entries were viewed, played and tested by over 400 members of the general public who attended the event. 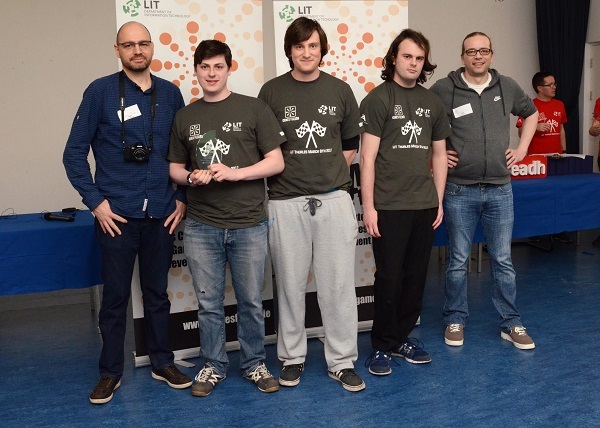 Second Year LIT Game Development students win Best in Game Design with their game “I Wanna Be A Racing Game” at Games Fleadh 2017 which took place on the LIT Thurles Campus. They are presented with their trophy by Stephanus Meiring and Ingo Schumacher from EA Galway. 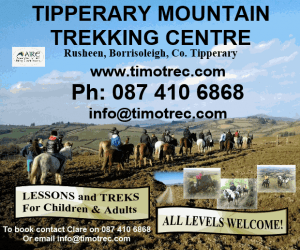 Photographed Left to Right: Stephanus Meiring EA, Alexander McAlister (Thurles, Co Tipperary), Nathan Dunne (Dundrum, Co Tipperary), Luke O Neill (Clonoulty, Co Tipperary), Eoghain McGrath (Beara, Co Cork), and Ingo Shcumacher EA. The judges, who included representatives from EA Games, Game Sparks, First Data, were tasked with the difficult job of reviewing the entries and scoring the students on their creations. Among the home team wins were fourth year Game Development students Declan Cordial, James Walsh and Shane Hayes who won Best in Original Audio Music with their entry ‘Fragments of the Damned. Third year Game Development students Joe O’Regan, Sean Horgan and Brian Ryan claimed the title Best Windows Game for their game “AntiBody”. Another third year Game Development team, made up of visiting Canadian students Christopher Law, Noah Petrides, and Settimio Falsetto, was awarded Best in Team Performance for the game “LightWave”. 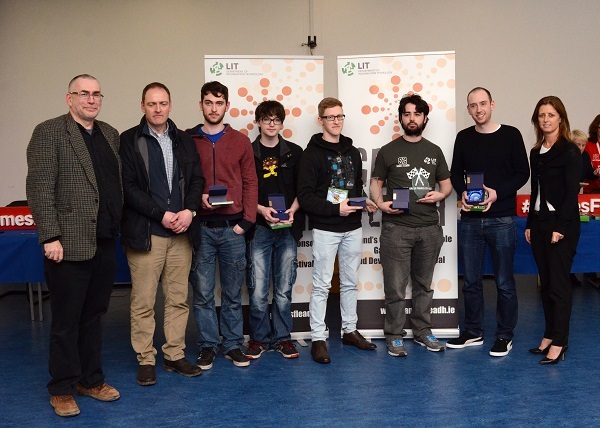 Alex McAllister, Eoghain McGrath, Luke O Brien and Nathan Dunne, who are all second year Game Development students at LIT, were awarded Best in Game Design for their game “I Wanna Be A Racing Game”. which took place in the LIT Thurles Campus on Wednesday March 8, 2017. Photographed with Ms O’Conell are Dr Chris Exton UL Lecturer, Clem O’Donnell UL ICT Learning Manager, David Ryley, Christopher Brady, David Ryan, Joseph Greaney and Shane O’Malley. LIT’s Robocode team who comprised of first years Ciaran Bent, Rory Ryan and Owen O Dea came third in the national Robocode Competition, which involved programming software tanks using the programming language Java. 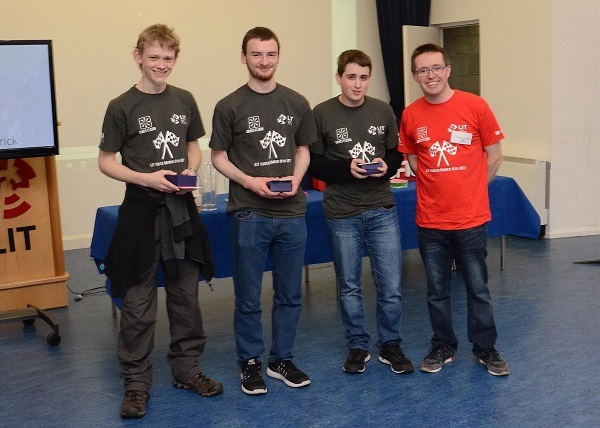 IT Carlow were the overall winners of the national Robocode Competition. 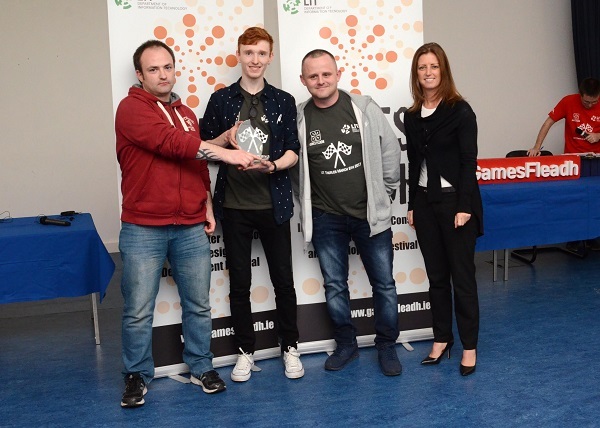 Fourth Year LIT Game Development students win Best in Original Audio Music with their game “Fragments of the Damned” at Games Fleadh 2017 which took place in the LIT Thurles Campus. They were presented with their trophy by Stephanus Meiring and Ingo Schumacher from EA Galway. They are presented with their trophy by Janice O’Connell Head of the IT Department at LIT. Photographed Left to Right: Joe O’Regan (Thurles, Tipperary), Sean Horgan (Killarney, Kerry), Brian Ryan (Cashel, Tipperary) and Janice O’Connell LIT. 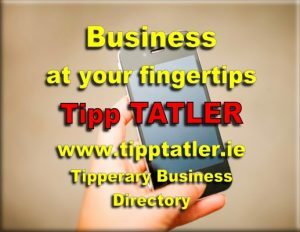 which took place in the LIT Thurles Campus on Wednesday, March 8. They were presented with their trophies by Dr Liam Noonan from LIT Thurles Campus. Photographed Left to Right Ciaran Bent (Scarrif, Clare), Rory Ryan (Kilrush, Clare), Owen O Dea (Ennis, Clare), and Dr Liam Noonan LIT. 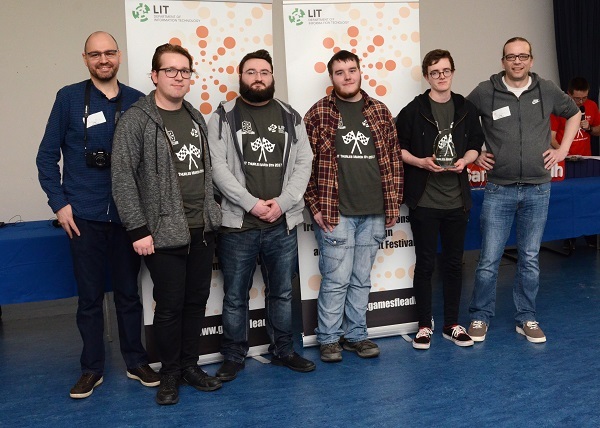 Third Year LIT Game Development students win Best in Team Performance with their game “Light Wave” at Games Fleadh 2017. Photographed Left to Right: Stephanus Meiring EA, Christopher Law (Ontario, Canada), Noah Petrides (Ontario, Canada), Settimio Falsetto (Canada), and Ingo Shcumacher EA.